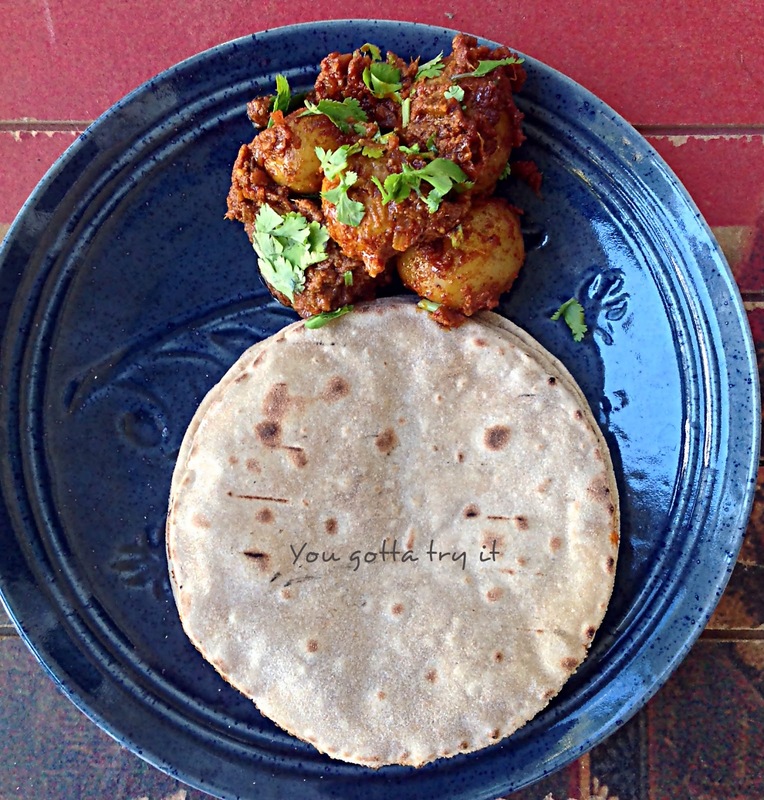 Kadai Aloo is a very delicious and easy to prepare spicy dish. 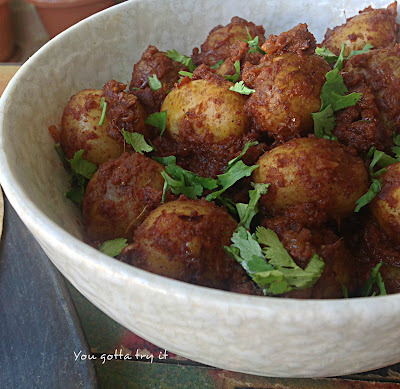 You can replace baby potatoes with regular potatoes, cottage cheese (paneer) or even chicken. I love potatoes in any form. Potato is rich in nutritional value and an excellent source of antioxidants and carbohydrates. These small and cute baby potatoes tastes great when you cook it with skin. Make sure you wash it properly before cooking. This dish goes well with Indian bread (Chapathi) or plain rice. Boil the baby potatoes with little bit of chilli powder, turmeric powder and salt. Once it is cooked, drain the excess water and keep it aside. Soak cashew nuts and onion in a bowl with few spoons of water for ten mins. In a blender grind this into a fine paste. 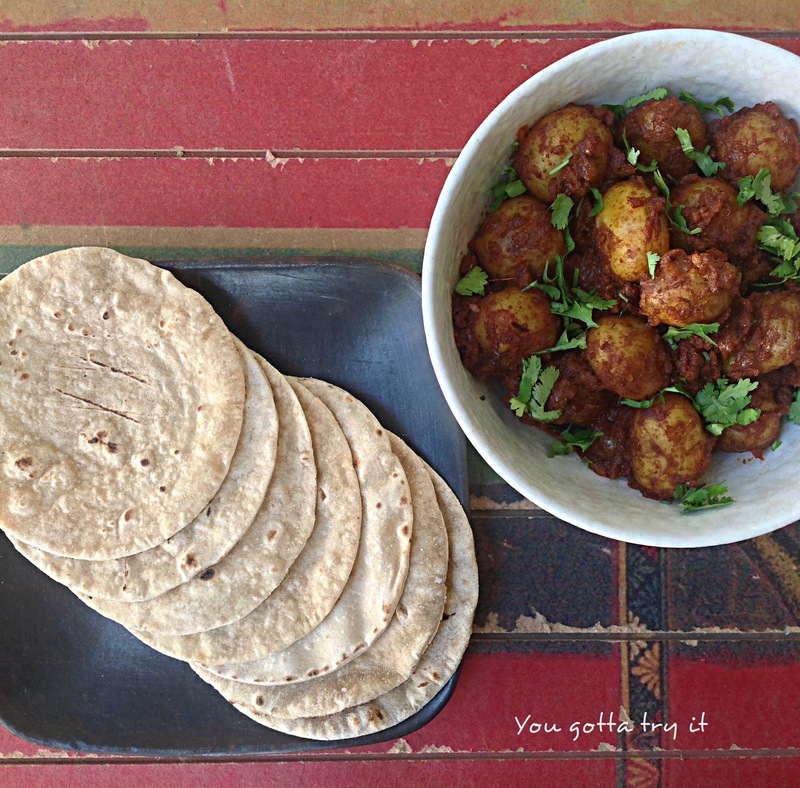 In a small bowl, mix all the masala along with lemon juice and a tablespoon of water. Heat oil in heavy bottomed pan and fry onions till it become brown in color. Add crushed ginger- garlic paste to it and saute well. Add the masala mix and stir well for 1min. Then add the boiled baby potatoes and salt. Stir till oil starts appearing from the sides of the pan. Add the cashew nut - onion mix and remaining water. Mix well and close it with a lid and cook till water gets dried completely. Garnish it with chopped coriander leaves and serve it hot with Chapati or rice. P.S: I mixed equal portions of Kashmiri red chilli powder with regular chilli powder to balance the spice level.